How cute was this book? Like seriously, so adorable! Over all I think this book is really a fantastic Holiday read, I'm a huge fan of how it incorporated different Holidays and traditions, not just focusing solely on Christmas. I generally really enjoyed the stories, I found the contemporaries to be more enjoyable than any of the fantastical stories. With each story being only around 30 pages it was difficult to understand and get into any of the concepts that weren't straight contemporary. I had some I liked more than others and I've rated each story individually. Midnights - Rainbow Rowell : 5/5 - This started off the book with a bang, Rainbow Rowell does it again! I did not want this story to end, it was only 30 pages and I was so invested in the story and loved the characters, this was by far my favourite part of the book! The Lady and the Fox - Kelly Link : 2/5 - This was not a good follow up to the first story, I was really quite disappointed in this one. I found it kind of boring and a bit confusing. there was a magical aspect that was pretty cool, but at the same time it wasn't explained very well and I couldn't connect with the characters at all. Angels in the Snow - Matt De La Pena : 3/5 - This was a pretty cute story, I liked the characters and found an easy connection with Haley. That being said the story was a little slow and not my favourite, but still pretty cute! Polaris is Where You'll Find Me - Jenny Han : 4/5 - Now this was a Christmasy read! 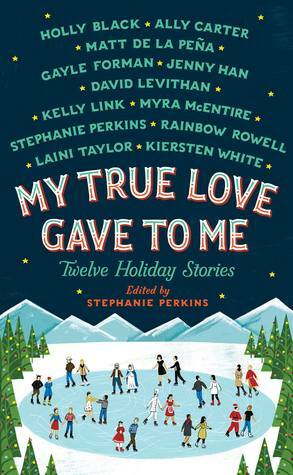 Full of elves and love and Christmas magic, I thought this was very enjoyable! Even though it was set in a different type world, it worked and it didn't need much explanation, so adorable! It's a Yuletide Miracle, Charlie Brown - Stephanie Perkins : 5/5 - I loved this story! The characters were too cute and their little romance warmed my heart! I loved North, he was one of my favourite guys from all the stories, such a sweetheart! Your Temporary Santa - David Levithan : 3/5 - This story was pretty meh for me, I felt no connection with the characters. I thought it was a cute concept but nothing was really explained. The two main characters were so separated throughout most of the story that I couldn't feel a connection between them. The story was cute, but I wanted more. Krampuslauf - Holly Black : 3/5 - This was a fun story that started off promising but kind of slacked nearing the end. I thought the traditions were really interesting and I loved reading about them, and even the party planning aspect as neat. However, I wasn't a fan of the magical elements because I just felt like it wasn't explained very well and the characters were kind of annoying. Still, not a bad read. What the Hell Have You Done, Sophie Roth? - Gayle Forman : 5/5 - Oh I loved this story, I loved loved loved it!! The characters were just so adorable and their relationship and interactions were really fun to read! This one left me wanting more and I wish this was a whole book by itself! Beer Buckets and Baby Jesus - Myra McEntire : 3/5 - This was a fun story, I think it wasn't my overall favourite because I'm really not into the "bad boy" type characters. But Vaughn grew on me by the end and I thought this was a nice fast paced save the day type of story. Welcome to Christmas, CA - Kiersten White : 4/5 - I really enjoyed this story! I wish there was a bit more connection between the characters but overall I thought it was super cute and fun to read. I also feel like this would make the cutest Christmas movie! I'd watch that!! Star of Bethlehem - Ally Carter : 5/5 - SO CUTE. I loved this story start to finish. I even found the twist/secret reveal at the end to be really surprising. Another favourite, how cute was Ethan's family? Loved them! The Girl Who Woke the Dreamer - Laini Taylor : 2/5 - This one was another disappointment for me. I think I just need more time and detail to get into stories like this with more magical elements, etc. Overall, I definitely recommend this book for a nice holiday read! I like how the stories don't intertwine so really you can just pick this up and read one or two stories a year if you wanted! LOVED IT! Also... This is the UK cover and its AMAZING and I want it!!! I've seen this book doing the rounds, but this is the first out right honest review I've read for it. I think my individual story ratings pretty much match yours exactly. I was disappointed with Laini Taylor's story because I love Daughter of Smoke and Bone. Oh well. :( I think North was my favorite guy out of the whole book. Gotta love Stephanie Perkins!